Wilmington Friends School offers a college preparatory curriculum—including athletics, the arts and community service—in which Quaker values and high expectations are mutually supportive. The defining belief of Quakerism is that there is “that of God” in everyone. That belief gives rise to a school community that welcomes a variety of faith traditions and where we share an obligation to seek and answer what is best in ourselves and in others. Students at Friends are challenged to realize their potential: as learners, well prepared to succeed in college and career; as leaders, recognizing their power and opportunity to be agents of change; and as active and responsible members of communities, from the classroom to the world. The school seeks to serve students, preschool through grade twelve, who demonstrate ongoing promise in their ability to succeed at Friends, both academically and in meeting expectations for integrity and conduct. Our Makerspace–Wonder Funder Space (WFS, the same acronym for Wilmington Friends School)– is portable so that it can transform the library in virtually seconds. To develop the space, we purchased a cart on wheels and collected items which were sorted and labeled by students. To set up the space, we use long tables that can easily be rearranged to accommodate various configurations. Although we provide chairs, the students generally like to stand to create and move to the cart. In our Wonder Funder Space, students create with recycled and repurposed items including cardboard, glue, duct tape, plastic tops, fabric, popsicle sticks, magnets, cupcake liners, modeling clay, CD’s, foam, and other assorted items. Our Wonder Funder Space is one of the available offerings that students may go to during lunch hour; others include Math Club, Open Art Studio, Dine Out and, of course, outdoor recess. The idea to develop a maker space came out of a second grade Social Studies Unit about Inventions. It all started with a book, Rosie Revere the Engineer. After reading the book, students had an opportunity to imagine an invention, name it, and then build it with an assortment of materials (tying to stewardship, recycling and repurposing). Students presented their inventions to a panel (fashioned somewhat like the television show “Shark Tank”) to explain the purposes and benefits of their inventions. Our “Shark Tank” panel consisted of two trustees, our head of lower school and Lower School Assistant Head as well as an inventor from the Dupont Company. 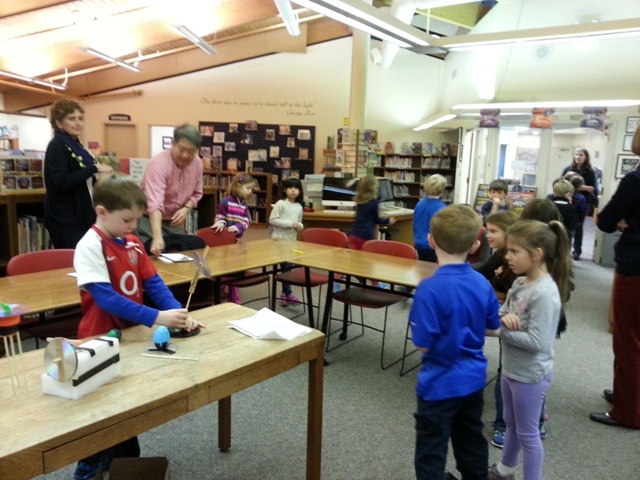 In addition, our second graders met with our ninth graders to discuss their inventions, and the ninth grade students are now in the process of drawing the ideas in Google SketchUp to print them on the 3D printer used in their physics and computer science classes. This unit enhanced student engagement, collaborative efforts, creativity, and our students’ ability to articulate and answer questions about their products. Because of this unit’s success, we wanted to continue the great work and possibilities it offered, and also make it accessible to all of our students. Thus, the Wonder Funder Space was born and lives in our library to be readily available to our kindergarten through fifth grade students. The library is a perfect home to our Wonder Funder Space. Students now see the library as a place to come and create, hopefully instilling in our students a lifelong love of the library. To help spark the creative process, we display books related to building, crafts and design, such as Lego® books. The Wonder Funder Space is a perfect fit for our school and Quaker philosophy. Quaker education fosters critical thinking, creativity and problem solving– skills that our students use while they create their inventions. In addition, one of the Quaker testimonies is stewardship, and by reusing and recycling products, students are putting stewardship into practice. As students come and we are able to see their interests, we will grow and adapt the program. It has been a wonderful learning experience for all. Students imagine and create a multitude of things. Some examples are a portable marble maze, a page turning device, a mouse playground to eliminate the mouse in the house problem , and an apple masher. Faculty serve as coaches and encourage the students to think, envision and turn their ideas into reality. Students learn to share the resources that are available, mentor each other and solve problems. Students learn to work in a multi-age environment, as creators from the ages five years to 11 years work together. Students freely express their creativity and realize the possibilities are endless. Our Wonder Funder Space is intended to help them feel the freedom and confidence to take risks and explore. Isn’t that how many of today’s inventions happened? The appeal of our Wonder Funder Space to the kinesthetic learner is evident, but a greater goal is to foster creativity and critical thinking in our students. In the future, we would like to add a technology element to the space. We plan to enhance it with a 3D printer and design programs such as Tinkercad, Sketch-up, Scratch. Students may also be able to create movies and/or Greenscreen projects. In addition, we hope to invite our specialist teachers into the space to focus on projects in areas such as art and music. Perhaps students would explore with Garage Band or Audacity with the music teacher or Photoshop with the art teacher. Our Wonder Funder Space could be an extension of our STEAM program, and students could have time to experiment further with concepts they learn in science, such as creating circuits or designing with light. Finally, our Wonder Funder Space could promote community outreach as we invite members of our Elder Community to share some of their skills. It may also emerge to be a full-fledged after school activity.